This 1 page printable sticker set includes "Reminder" "Appointment" "Important" "Bills Due" and "Payday" stickers. (This is an Instant Download DIGITAL LISTING, no physical item will be sent to you in the mail. ) This set includes non-editable PDF and PNG formats, plus a SVG cut file for your compatible cutting machine. 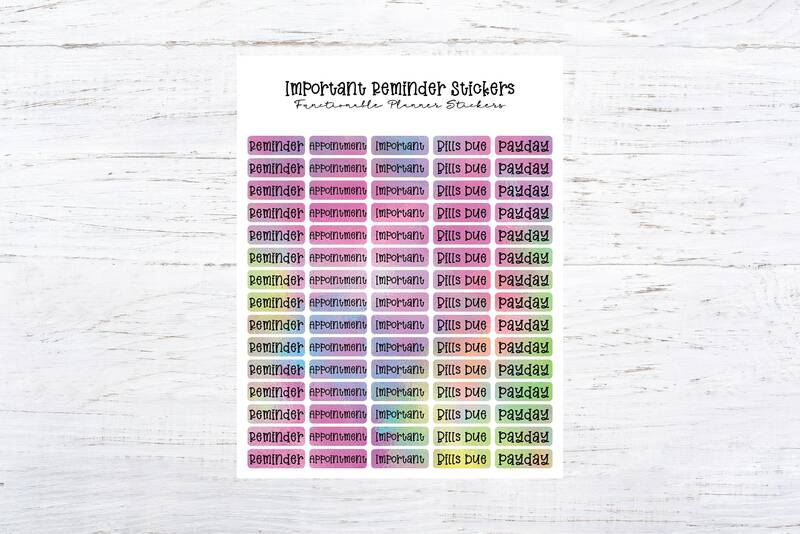 Print out at home on adhesive backed paper, or use cardstock and your favorite adhesive to stick on your scrapbook, journal, bullet journal, planner, organizer, agenda, calendar, etc! Very easy, ready to go, format. Just Print and cut out by hand, or with your scan and cut or PNG or SVG friendly electronic cutting machine. This set was designed to be printed on US Letter sized paper, but any similar dimensions should work fine! You can even shrink it down smaller if you'd like smaller stickers for littler pages. Stickers printed on US Letter Sized Paper PRINT APPROX. 1.5" wide by 0.5" tall.